This weird looking joseki has been made popular by Cho U from Japan. Afterwards it has also been picked up by the rest of the world. Recently Calvin Sun and Bill Lin battled for the title for the third Aga pro. Here we show game two out of three. 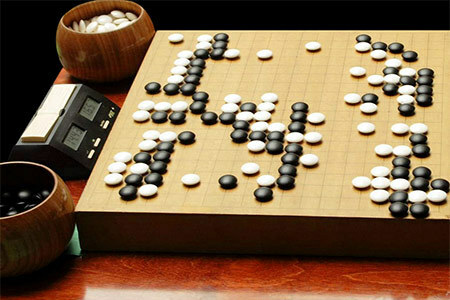 Go fans around the world watched as the first game of the long awaited jubango between Lee Sedol 9p and Gu Li 9p was played in Beijing, on Janurary 26, 2014. Lee Sedol’s wife and daughter returned from Canada (where his daugter is studying) to support Lee for the first game of the match. Lee Sedol 9 dan and his daughter. In Gu Li’s corner, the legendary Nie Weiping 9p was present to support his former student. Nie Weiping 9 dan drops in for the show. Lee Sedol and Gu Li start the first game of their 10 game match. Lee Sedol, playing black, started with the micro Chinese formation (3, 5 and 7), and white 6, 8 and 10 were typical of Gu Li’s powerful style. After white’s jump at 22, the flow of the stones seemed good for white. However, when white tried to consolidate the corner with 28, jumping at black 29 was a good response and white 30 was questionable. Black 37 and 39 was a good combination, and the game became even again. White 60 was a probe, but the timing was questionable. When Lee counter-attacked with 61, he took the initiative. After the moves up to 71, the game became good for black. Black 95 and 99 were a sharp combination which created trouble for white’s center dragon. When white tried to break out up to 116, black 117 was a textbook example of a leaning attack. White had to give up his corner, but he successfully complicated the game up to 130. Black 117 is a perfect example of a leaning attack. White’s large group in the center is threatened indirectly. However, black didn’t experience any serious trouble managing his groups, and white 140 was questionable. Black 149 to 153 was a nice combination, which simplified the game. White lived with 174, but it wasn’t enough to catch up and black took sente to begin the endgame. Black 183 was an excellent endgame tesuji, which relied on black’s earlier tesuji at 39 to make miai of connecting. Black 191 was the finishing blow. With 250, Gu Li was looking for an appropriate place to resign. After black 251, which made miai of ko or seki in the corner and destroyed white’s only big territory, Gu resigned. The first game of the jubango was exciting to watch, with both players coming up with many unexpected moves. However, Gu Li may have been dissatisfied with his play in the middle game. Gu Li and Lee Sedol give a post-game commentary. Game 2 of the series will be played in Shanghai, on February 23. Younggil will be back with a game commentary soon! You can keep an eye on this page for updates. What did you think of the first game of the MLily Gu vs Lee Jubango? David Ormerod, with An Younggil 8p.